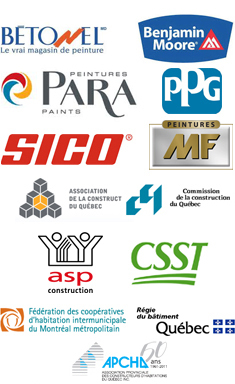 Since 1998, Findécor is well-known in Montréal for its talents in the residential and commercial painting field. We have been painting buildings around you for 16 years. The Bay stores, SAQ branches, daycare centers and your long-lost friend house, we have been there. From Quebec to Ottawa, but most of all in the city of Montréal, you can be sure you know at least one building we have painted, as we don’t stop making the world nicer all around you. Someday, maybe we will paint your house! If your project needs more than only painting with a paintbrush and a roller, don’t worry, as our team can carry out various renovation tasks: installing gypsum, removing wallpaper, installing moldings, plastering, sanding, applying venetian stucco, draghtproofing, replacing wood, staining, etc. After 16 years of construction painting services, we have so much confidence in our skills and in the products we use that we have decided to offer longer guarantees. In fact, we did observe that the painting projects we did when we begun the company still have the same appearance, which prooves that we did offer quality services. Moreover, there is so much research and development in the painting field, —with dozens of new paints and coatings products on the market each year, and they are always getting better in quality—, that we have no doubt that the paints and stains we use are reliable. Painting an aluminum exterior siding is guaranteed for 15 years against peeling and bubbling. We always paint aluminum with the best 100% acrylic paint, which ensures great adhesion as well as a good resistance to bad weather. Stucco that has never been painted is now guaranteed for 25 years. we always proceed to stucco painting using a spray painting gun that reduces the surface’s porosity, thus helping the prevention of mold. We now offer 25 years’ guarantee on brick wall staining and painting, if it has never been painted or stained before. For horizontal wood siding, we offer a 15 years guarantee against peeling. All interior painting is guaranteed 5 years against peeling. Our customers satisfaction is important to us. *Please note that to obtain a warranty, those details need to be indicated on your contract. Some exceptions may apply. What is a good professional painter? Interior House Painting Services in Pointe-Claire, Pierrefonds, Baie d’Urfé, Senneville, Dollard-Des-Ormeaux, Beaconsfield, Dorval, Kirkland and Many more..